Ignores the whole patch connected to the In, when Enb is 0. 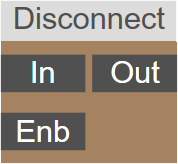 It's like a variable, but when the 'Enb' is in off state, the node breaks the connection between the nodes connected to the 'In' input, and the plug-in will stop processing them. Use this node with care. It has a unique color, because this process can lead to strange behavior. If you don't know what it does exactly, do not use it. Enb: Enable (nonzero = on, 0 = off). Out: The last sample with 'Enb' in on state.